New England Telemedicine specialists team with medical providers of rural Maine. Great medical care requires primary care providers and specialists to work closely together. Right now many patients in Maine are traveling long distances to obtain specialty consultation. According to the American Hospital Association, up to twenty percent of patients will bypass local rural hospitals for distant tertiary care facilities. This geographic barrier hinders optimal patient care and increases costs. 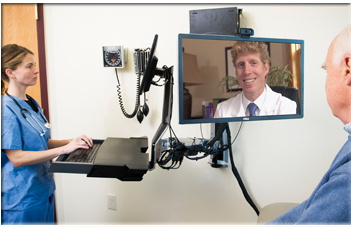 New England Telemedicine uses real-time synchronous high definition teleconferencing technology to overcome geographic barriers and bring our specialists to your community hospital. We are committed to working closely with local medical providers and hospital leadership to improve the health of Maine's residents. Our physicians are board certified, licensed and insured in the state of Maine. They become credentialed and active members of your medical staff. We partner with primary care providers and rural hospitals to provide longitudinal outpatient care. Many of our physicians are instructors of medicine at prestigious academic medical centers. 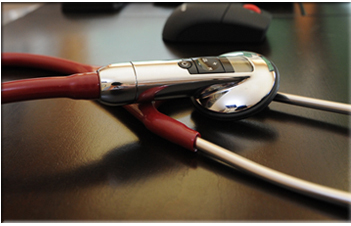 We utilize state of the art peripherals such as stethoscopes, otoscopes and dermatoscopes that are designed specifically for telemedicine. These devices allow us to examine the patient from a distance. We rent outpatient clinic space from your hospital on weekends so you keep patients close to home. Patients often have their consultation sessions with us only a few feet from their PCP's office. We hire your hospital's qualified medical assistants to work on weekends as in-office facilitators for your patients. All of our outpatient telemedicine consultation sessions are fully encrypted in order to comply with HIPAA regulations. We are recruiting additional specialists so please check back soon. We are already connected to most Rural and Critical Access Hospitals in Maine through dedicated, high speed fiber optic connections provided by the New England Telehealth Consortium. This private broadband network uses business class Quality of Service (QoS) technologies to ensure reliability. Our team utilizes Virtual Private Networks (VPNs), firewalls and encrypted, HIPAA compliant, real time high definition teleconferencing technology to keep patient information secure. We participate in Maine's Health Information Exchange allowing simplified clinical integration. Our equipment can be set up and stored easily. 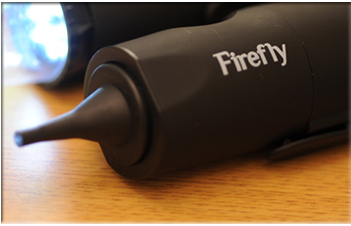 The Firefly DE550 Handheld USB Digital Otoscope was specifically designed for telemedicine practices. It enables our specialists to examine a patient's ear in real time. With high definition 1.3 Megapixel resolution, 30 frames per second and 150x magnification, optimal image quality is delivered to the medical provider. This otoscope allows us not only to view the patient's ear while they are in the room but still images or video may be captured for storage in the patient's electronic medical record. 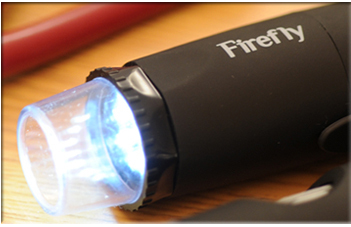 The Firefly DE350 Handheld USB Digital Dermatoscope was specifically designed for telemedicine practices. It allows our specialists to examine our patient's skin in real time. With high definition 720x480 resolution, 30 frames per second and up to 90x magnification, optimal image quality is delivered to the medical provider. Not only can the dermatoscope be used to view the patient's skin while they are in the room but images may be captured for later review. An embedded measuring tool within the Firefly software lets us precisely measure skin lesions at each visit. This enables our practitioners to measure and monitor skin lesions for growth over time on subsequent clinic visits. Our telemedicine stethoscopes were created to allow the patient's heart sounds to be streamed in real time over a secure web based server to our medical specialists. We are able to listen to the patient's heart with both the bell and diaphragm as needed. Heart sounds can be slowed down and analyzed by our cardiologists. These sound files may be stored on our secure encrypted server for later review or comparison.